There are few destinations as glorious as Greece. Boasting both idyllic islands and mainland majesty, here's a country that's got it all. Spectacular sunsets, a close-to-perfect climate and blissful beaches. Not to mention an infamous historic and cultural heritage, as well as jaw-dropping landscapes and swoon worthy shorelines. Seriously, what's not to love? 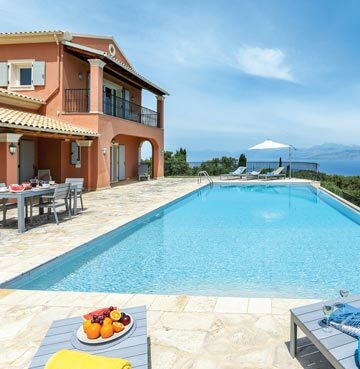 Whether you're a couple looking for a secluded getaway, or a family with kids desperate to make a splash, our Greek villas with pools are hard to beat for an authentic serving of the laid-back lifestyle. Forget sunlounger scrambles or playing by someone else's rules, when you're soaking up the sun in your own private pool it's all about you and yours. Sharing your precious space with hordes of other holidaymakers is a thing of the past. Instead, enjoy having the run of the place in one of the most popular holiday destinations in the world. Here you're guaranteed some ultimate unwinding. Villas with private pools are all about freedom and flexibility. From beachside locations where the pool water looks like it's part of the sea, to luxury hilltop infinity-style finishes with panoramic vistas that stretch out for miles. Take a dip year round with one of our heated pools, the majority of which are warmed free of charge during the winter months. Large pools are available for big groups, or for those of you simply keen to keep fit with some morning lengths. 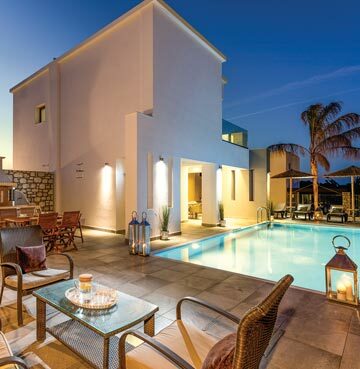 For families travelling with little ones, villas with gated pools are the perfect solution for peace of mind. All you have to do is pop open the gate when you're ready to play together! Dripping in Grecian charm, Kefalonia is a firm favourite for many travellers when it comes to the Greek Islands. Luscious landscapes, historic treasures, rugged cliffs and never-ending natural beauty make for an away-from-it-all holiday to remember. Boasting some of the best beaches in all of Greece, and waters considered to be some of the cleanest in the world, you're a shoo-in with this holiday hit. Villa Trapezaki Blue is impossible to beat for its sea front location. Jaw-dropping panoramas unfold from all angles, with stunning views along the coastline and out across the sparkling Ionian Sea. 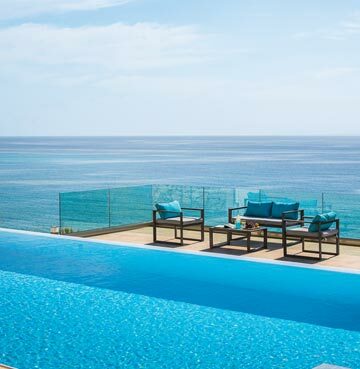 A gorgeous terrace and infinity pool are spectacularly positioned to make the most of the breathtaking scenery. 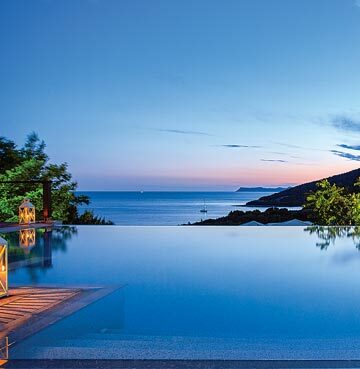 Water shimmers into the horizon as pool and sea merge flawlessly, creating a mesmerising moment of pure relaxation. A place that caters for every taste, it's no wonder holidaymakers fall in love with this traveller's treasure. Quiet coves, secluded beaches, mountain villages, traditional towns and bustling resorts all play a part in Crete's irresistible appeal. Blend leisure with pleasure and explore a wealth of historical sites and cosmopolitan cities on your Cretan villa getaway. Villa Melina perches in a prime location on charming coastal cliffs overlooking stunning Souda Bay. Surrounded by lush greenery, beautiful gardens and plenty of spacious terraces – here you have the perfect lookout point. The large private pool is perfect for making a splash with family frolics, or simply just unwinding in while enjoying the views. An idyllic set up for getting a taste of the much coveted traditional Greek lifestyle. Unspoilt and overflowing with character and charm, lovely Lefkas is a magical Mediterranean destination. Enjoy the laid-back atmosphere and timeless appeal of this idyllic island. Dotted with traditional villages and historic highlights – not to mention beautiful beaches and intense landscapes – Lefkas might be small, but it most definitely packs a punch. Agios Ioannis is home to a wonderful wide sandy beach with popular tavernas, and it's here you'll find Villa Kozanitis. Just a leisurely five minute stroll apart, this luxurious villa is a match made in heaven for beach and countryside lovers alike. 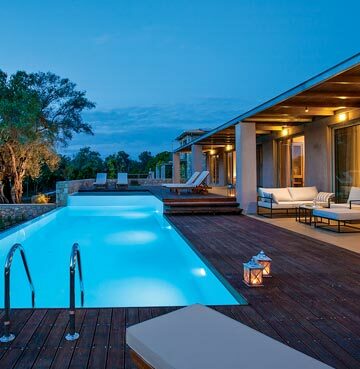 A stylish infinity pool splits across two levels and is surrounded by stunning wooden decking and a large pergola. As beautiful as the interior of Villa Kozanitis is, the refreshing waters are far too irresistible to ignore. Prepare to spend hours floating around your personal pool paradise! Blessed with 300 days (give or take) of sizzling sunshine a year, radiant Rhodes is one of the largest and most fertile of all the Greek Islands. A haven for beach loving holidaymakers, uncover a mixture of off-the-beaten track beauties and bustling resorts teeming with buzzing nightlife. Culture vultures can rejoice! The atmospheric island abounds in historic heritage and amazing ancient architecture. Not wanting to leave out lovers of the great outdoors, the island's interior is a treasure trove of scenic landscapes and nature trails. Clue's in the name with Villa Paradise Beach. A stunning beach front properly on Kiotari's long golden sandy shores, watch the crystalline waters lap against the sand from your private infinity pool. One of the most idyllic pool set-ups, the glistening waters blend seamlessly into the horizon. And as if the paradisiacal pool wasn't enough, enjoy panoramic sea views, a huge outside living area and steps that lead you right onto the sandy stretch. Hello holiday euphoria! Pssst. Looking for a gated pool for little ones? Look no further than the peaceful walled Villa Ibiscus located just outside of Ladiko Bay. Lush scenery and blissful beaches are part and parcel of Corfu's untamed beauty. Uninterrupted seascapes and breathtaking vistas of rugged countryside are just some of the perks of staying in a villa nestled into the peaceful mountainside. Glittering azure waters and white pebbly coves fringe Corfu's shores. While traditional tavernas serve up delicious dishes of Mediterranean medleys and local flavours in charming little fishing villages. The hilltop haven, Villa Aetos, can be found close by to the charming town of Kassiopi – a beautiful bustling harbour. A large, graduated private infinity pool is the pièce de résistance of this luxurious home from home. Surrounded by olive groves and orange trees, the sweet scents fill the air and linger on the breeze. Savour the sight of the gently curving beach below as you swim in the refreshing waters. It'd be easy to spend hours floating in this perfect pool – simply admiring the view – or stretched out on the sunloungers carefully positioned around the spacious terrace. Awe-inspiring scenery and dramatic landscapes teeming with forested wilderness and traditional rural villages? Here it is – indisputable proof that Zakynthos is far more than a buzzing nightlife destination. Mighty limestone cliffs plummet to turquoise depths and golden sandy beaches. The tranquillity and seclusion of the west is mirrored by bustling resorts along the south eastern coastline. A real life island beauty, whether you're after peace or a party, Zakynthos is sure to answer all your holiday prayers. 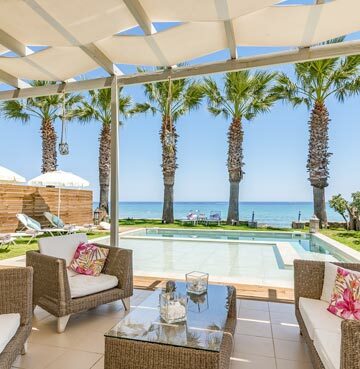 Villa Gaia in the coastal village of Beloussi is the perfect place to find peace and quiet. Nestled on the waters edge, this beautiful home away from home sits in a stunning sea front position. Overlooking a small private beach which is shared with two of our other properties (Thalassa and Uranos). The undisputed winning feature at play is the private pool. Designed with a shallow section to sit and enjoy the view (or splash safely with your little ones), and a deeper section below for a little swim. Welcome to Greek mainland majesty! The Epirus region is one of the best kept secrets in all of Greece, and is the perfect escape for some rest and relaxation. Matching natural beauty with a traditional lifestyle, a holiday here is one of tranquillity and simplicity. Fertile valleys, rugged mountains and captivating coastlines are just waiting to be explored and are largely untouched by the tourist trail. Get ready for an authentic Greek experience. Make the most of your surroundings from Villa Luna. Surrounded by luscious leafy hillsides and perched perfectly overlooking the Ionian Sea, there's not a bad seat in the house when it comes to this luxurious home from home. Steps descend into the pool with dramatic elegance and make for the perfect place to paddle. One thing's for sure, if you think the pool looks magical in the day – just wait for the sun to set! The sky glows in orange and pink tones, and you can enjoy the whole thing from your heated infinity pool.